But anyways, UTI's are very common, I know that I used to get them all the time. I don't really know what I did to change that, besides drinking a jackload more water than I used to, but it really hasn't been an issue for me lately. But, knowing how common UTI's are, I was happy to do a review for Cystex Liquid Cranberry Complex. If you are a woman who suffers from UTI Symptoms, you may reach for the cranberry juice at first sign of a UTI. But drinking cranberry juice can get old. I know that after one or two glasses, I am done! Not to mention the sugar and calories that some juices contain. 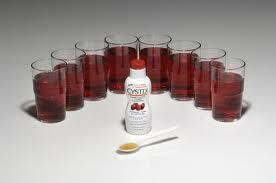 But, with Cystex Liquid Cranberry Complex, ONE tablespoon equals EIGHT glasses of cranberry juice! 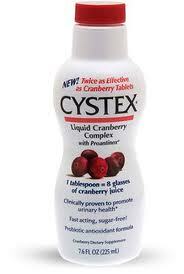 You can even take Cystex Liquid Cranberry Complex daily to prevent recurring UTI's. It doesn't taste bad, just like cranberry juice. I am not particularly fond of cranberry juice in the first place, but I would much rather take one tablespoon of Cystex than to have to drink eight glasses of cranberry juice, for sure! I think Cystex is a great idea, especially considering that millions of women suffer from multiple urinary tract infections. This will make treating and preventing them much more bearable for lots of ladies! Thanks Cystex for such a great product! Would you like to win a bottle of Cystex Liquid Cranberry Complex?? Go here to the Cystex website, and come back here letting me know something you learned! PS. Respiratory infections are the most common type. Thanks, Google! I received a sample product in order to conduct this review. Although a sample product was received, all opinions are my own and no monetary compensation was received. I went to the Cystex website and read it, learned that women have an increased chance of UTIs during menopause due to lack of estrogen. Tried watching videos. Wouldn't let me. Bummer!